San Diego, CA - The Ontario Reign (44-18-4-1) scored three goals in the third period to take down the San Diego Gulls (38-23-4-2) 4-2 Friday night at Valley View Casino Center. The win clinches the Western Conference regular-season title for the Reign and extends their winning streak to five games. Box Score The Gulls kicked off the scoring with 23 seconds remaining in the first period as forward Matt Bailey knocked in a rebound off the pads of Reign netminder Peter Budaj (W, 32 saves on 34 shots). Early in the second period, forward Jordan Samuels-Thomas evened the contest after deflecting a Ryan Horvat shot between the legs of Gulls goaltender Anton Khudobin (L, 38 saves on 42 shots) at 4:29. Defenseman Kevin Raine added the second assist. 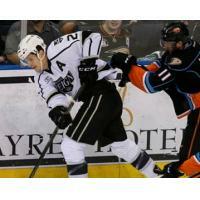 The Reign continued to pepper Khudobin with chances, outshooting the Gulls 33-16 after two periods. Forward Kris Newbury put the Reign in front and extended his personal point streak to five contests (three goals, four assists) by ripping a shot over the glove of Khudobin off the left-wing circle at 12:14 of the third period. Forwards Nic Dowd (shorthanded, 16:10) and Michael Mersch (power play, 16:47) added special-teams tallies in a flash to quickly make it 4-1. Gulls forward Mike Sgarbossa capped the game scoring at 16:54 and completed a stretch of three goals in 40 seconds. The Reign finished the game 1-for-5 on the power play while the Gulls went 0-for-6. The Reign wrap up the 2015-16 regular season tomorrow, Saturday, April 16 against the Gulls at 7:05 p.m. at Valley View Casino Center.